With a trip to Wales for my daughters birthday over the weekend, having a hire car to get me a few places opened up alot of oppurtunities. The weather would vary across the weekend (Friday - Tuesday) and to start we headed off as a family to mainly help Emily catch some fish in the nice weather. Unfortunatly the river we got the day ticket for was teeming with Grayling so my daughter caught a few out of season grayling and the odd trout. She was limited by where she could fish as she was fishing from the bank so needed to fish pools which had a bit of depth or features close in and thankfully we found a natural weir. She hooked her first fish without even noticing, i thought she was struggling with her casting so took the rod off her to again show her how to cast and i realised she had a fish on. Passing it back to her she quickly brought it in while i netted it. The weekend days were all holiday, zoo's, theme parks, beaches etc we did get to do a bit of crab fishing which Emily excelled at (Emilys mum losing out despite catching a crab first) 24' heat on a jetty as a family was a great experience. The end of the holiday though the weather turned, we had 30' heat on the Saturday where we went to a zoo but after that it thundered and rained. Heading back to our caravan as the storm came closer after walking to a lighthouse. Made it just in time to watch the natural lightshow in the sky. 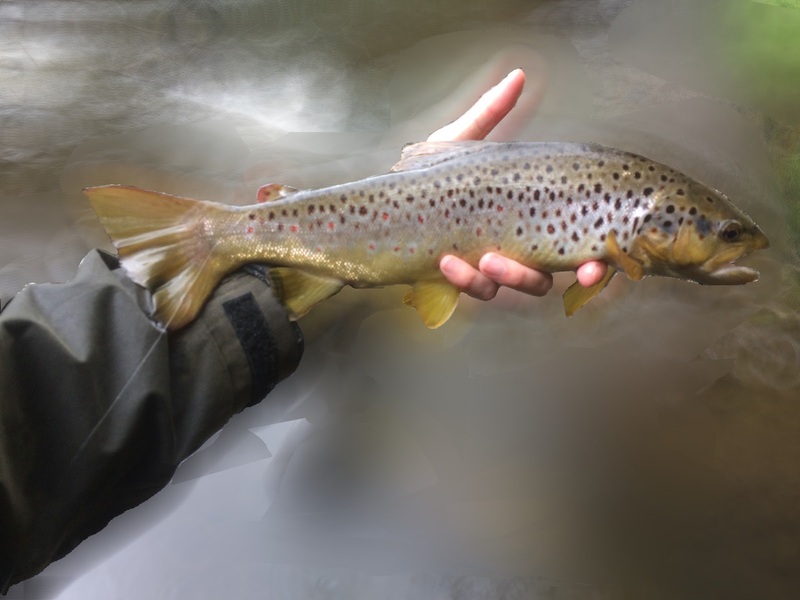 Using the rain as cover i headed on to a river in Wales i had seen but was unable to find if anyone had rights to it, i didnt see any signs but i blurred the background anyway incase anyone has a moan about it! There was a few rises in the rain but i opted for a streamer first to get a sense of size and boy did i realise it was going to be a good day. 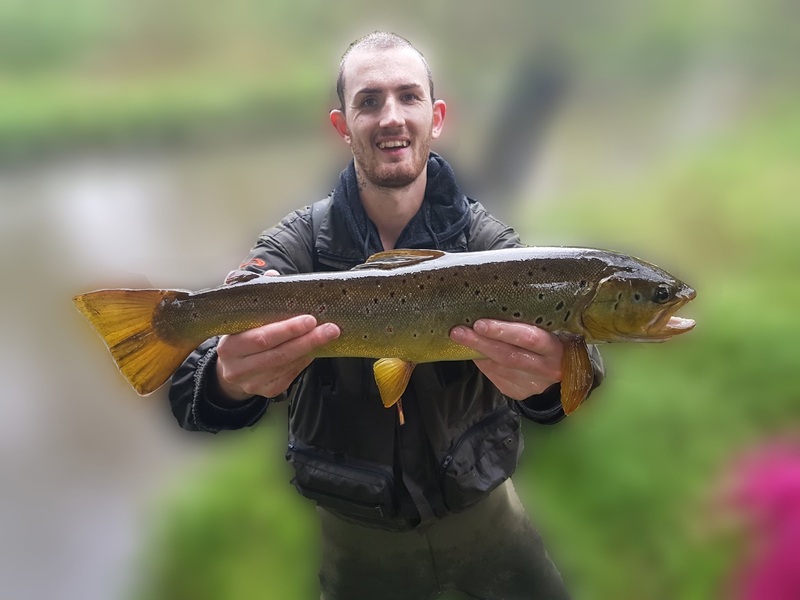 First cast a decent fish came up for the streamer (Martins Smiths Minnow) but i was a little rusty, then i had a nice fish to start off with. I barely fished 100m but i had missed 3 more fish and had 2 more, another 18inch trout and a 20inch. I was more than happy with these but i opted to carry on. The rain was pouring down and the river was now colored but the next pool gave me the fish to reward me for all my efforts earlier this season. It came up slow, i seen it turn underneath the fly and i was unsure if it had took it, i struck anyway and it slowly turned away, then it realised it had been hooked. 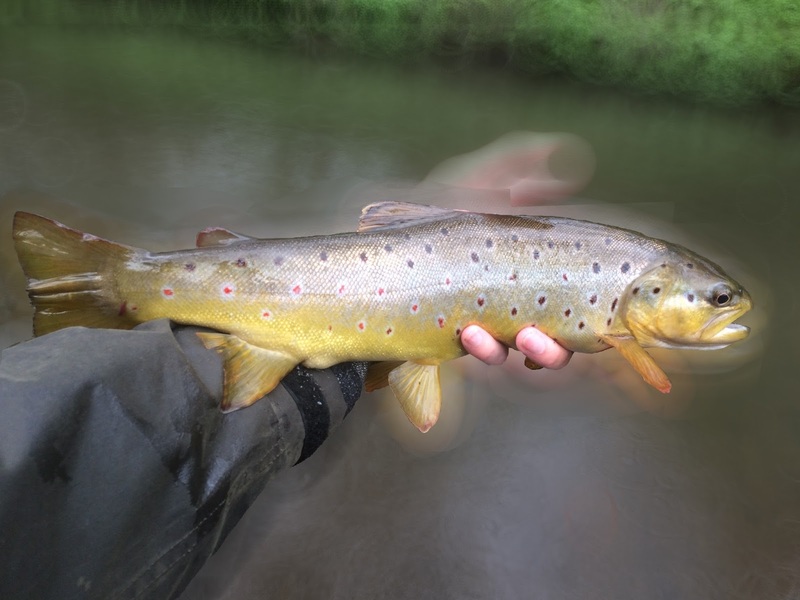 It pulled down deep using its weight and i held firm, it turned towards the nearside bank and i had to reach out in to the river as my rod was bent right over as i tried to pull it away from the safety of the bank and it's snaggy trees. I knew it was a decent fish but with my polaroids being prescription glasses so i can see better it gives a false impression on sizes and distances. However when it splashed the surface i realised it must be big, with experience of big fish i have lost and caught they have a very distrinctive splash. It fought hard but after a couple of minute i had tired it enough to land safely. With Becky waiting in the car nearby incase i wasn't allowed to fish here i rung her to come take a picture and the rest is history. It was a beautiful fish, immaculate condition and so thick from top to bottom. I was soaked through but it had all become worth it, all the poor days previous have built up for this moment and thankfully i didn't mess it up.